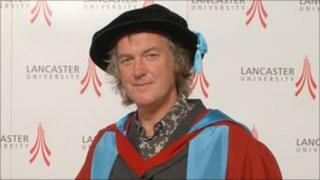 Top Gear co-presenter James May has been awarded an honorary degree by Lancaster University. Known as Captain Slow for his cautious driving style on the BBC Two show, he has become an honorary doctor of letters. He said he was "flattered" to receive such an accolade, and felt emotional returning to his former university. "It's very nostalgic, what with work commitments I haven't been back for 10 years. "I walked round the campus and it was very emotional, it doesn't really come flooding back but, more like a wall covered in posters, it hit me instantly. "It smells the same, feels the same but altered so I got slightly lost." May graduated in 1985 and remembers a time "bathed in benign sunshine". "But it must have rained really, it is Lancaster after all," he added.